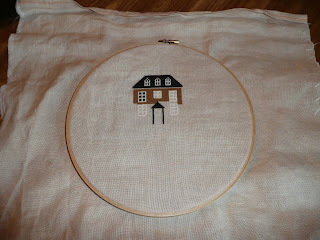 I started out stitching in hand and then with Q Snaps. Have never used hoops so I can't tell you which is better. However, after trying Q Snaps, I can't live without em now. Q Snaps does not leave marks on the fabric like hoops does which is a huge plus imo. Beautiful stitching, by the way. Love the fabric you're using. Nice job starting over again, Meredith. I use Q-snaps exclusively. I like the way it keeps my stitches taut.